You are here: Home / News & Updates / It’s #GivingTuesday! How To Make the Most of It. It’s #GivingTuesday! How To Make the Most of It. Note: This article first appeared in the November 21, 2018 edition of the Outer Banks Sentinel. You’ve heard of Black Friday, of course, and probably Cyber Monday. There’s even Small Business Saturday, if you want to support the little guys. After all these days dedicated to buying and bargain-hunting, there is a reprieve. 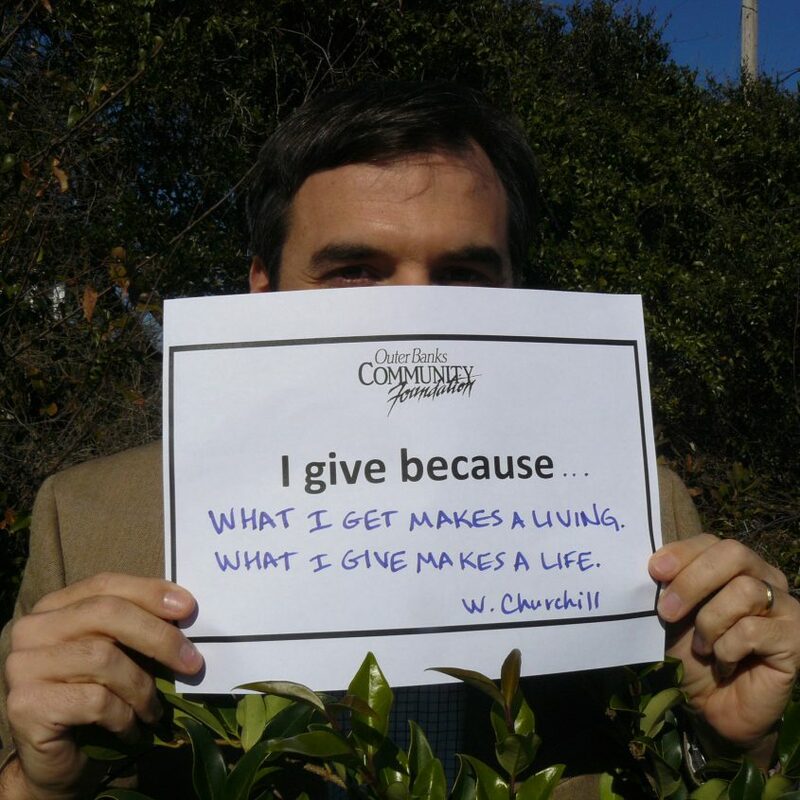 We now have Giving Tuesday. Billed as the global day of giving, Giving Tuesday is the antidote for consumerism, the one day each year we are supposed to pause from our shopping to give back to our communities. Falling on the Tuesday after Thanksgiving, Giving Tuesday has become a social media “movement,” its creators say, to celebrate and encourage philanthropy. A day of giving. Fantastic, right? Truly, anything that encourages generosity and benevolence is great in my book. But… At the risk of blaspheming philanthropy, I have to admit that sometimes I’m a little tempted to mutter “humbug” on Giving Tuesday. Maybe I’ve just gotten curmudgeonly in my middle age, but the whole thing feels a tad gimmicky to me, a desperate attempt to jump on the bandwagon of holiday spending. I don’t know about you, but I was buried last year in Giving Tuesday appeals. In 2017 I got emails from 20 different nonprofits—all on the same day—asking for help. Already this year, as of this writing—a full two weeks before Giving Tuesday— I’ve received Giving Tuesday emails from no fewer than eight charities. These are all really great nonprofits, but, sadly, most of us have only so much to contribute. If every nonprofit is asking every potential giver all on the same day, it’s going to lead to donor fatigue. I’m not the only Grinch. I just read an article by Joe Garecht entitled: “Why Your Non-Profit Should Avoid #GivingTuesday Like the Plague.” His point, among others, is that for all the time and energy that nonprofits devote to Giving Tuesday, most groups don’t raise enough money to cover their costs. Having said all that, for all my humbugs, there is definite momentum and excitement around Giving Tuesday. It really does present an opportunity to raise awareness for your favorite charity. If we can encourage a movement of community-mindedness, that’s pretty awesome. 1. Get A Match. People love Black Friday and Cyber Monday because of the special deals, and on Giving Tuesday there are special philanthropy deals that you can use to multiply your gift. The biggest one is Facebook, which is matching Giving Tuesday donations this year up to $7 million. For example, if you give $100 to your favorite charity through Facebook on November 27, Facebook will match your donation, dollar for dollar, and your favorite charity will get $200. Facebook may be on Santa’s Naughty List at the moment, but this is still a good deal for nonprofits. To get the match, your donation has to be through Facebook, and the offer runs out at $7 million, so give early in the morning (the matching starts at 8:00 am) to make sure your charity gets its due. 2. Be A Match. If you’re a major donor, consider making a leadership gift and creating your own matching challenge. Let’s say you have $1,000 that you could give to your favorite charity. Create a Facebook fundraiser, right on your own Facebook page, for said favorite charity. Promise your Facebook friends that, along with Facebook’s matching money, you’ll also personally match their Giving Tuesday donations, up to $1,000. Voila. If your friends give, your $1,000 just raised $4,000 for your favorite charity. You just quadrupled your impact. 3. Flaunt It. Peer pressure is a potent thing. I’m convinced that the Outer Banks is such a giving community because we’ve created a culture of philanthropy here. People give more when there’s social inspiration to do so, when they feel like they’re part of a movement. Use the power of peer pressure to do some good. If you give on Giving Tuesday, take an #unselfie, brag about your donation, make a video, tag your friends. Cultivate that culture of philanthropy, and use it to inspire and motivate your network. One last thought. Apparently our society has set aside one day for giving back—one day out of 365 days each year. Is the Tuesday after Thanksgiving really the only day we should think about philanthropy? Many food pantries, children’s programs, homeless shelters, etc., get a glut of donations and volunteers around the holidays, and then nothing in February. Ruthie’s Kitchen, our local, weekly “soup kitchen” program, suspends service in July and August because no one volunteers in the summer. One of the best ways to help a charity is through regular, sustaining donations. If your budget allows, please consider making an automatic monthly gift to your favorite nonprofit. The reliability of your contributions will help that organization with cash flow throughout the year. So this year on Giving Tuesday, I’d like to issue a challenge of my own. What if Giving Tuesday were not one Tuesday each year, but every Tuesday of every week? What if we all tried to find one thing to do each week to serve the Outer Banks, whether it’s walking one rescue dog or dropping $5 in a donation jar or setting aside one can of corn? Better yet, what if giving were simply an everyday act? Now that sounds like a movement to me. https://www.obcf.org/wp-content/uploads/2018/11/scott-unselfie.jpg 2304 2341 OBCF https://www.obcf.org/wp-content/uploads/2013/07/obcf-logo.png OBCF2018-10-23 13:41:272018-12-19 22:37:14It's #GivingTuesday! How To Make the Most of It.